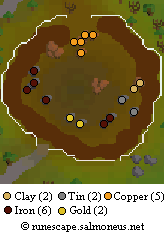 Located inside a large crator, the Rimmington mine has several iron ores, a couple gold, and some tin, clay, and copper. The abundant iron and few miners make this a good dropmining spot. Closest Bank: Falador west or Draynor Village.